Fox News Editor: End The White House Briefings And Stop Covering Trump Rallies, It's All Useless [VIDEO] - Joe.My.God. “We’re at a point where the White House briefs [the press] very rarely and when they do, it’s useless. We should stop the televised briefing. It’s counter productive, it’s turned into showboat theater, the substance of issues is not addressed. It’s become a forum for personal achievement and politic utility for the administration. Just as we should also stop having reporters at those Trump rallies. “Everybody should stop having reporters penned up like veal in the back of those things for the President to use as a prop, and then some of the reporters exploit that for their own personal benefit. This is not helping anybody. Get out of the hall. Leave the cameras, get the reporters out of the hall. 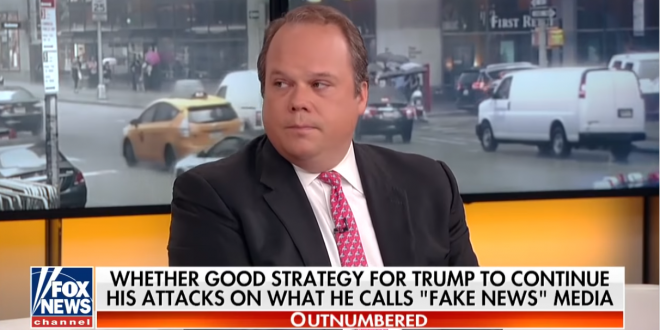 Quit letting him use you as a foil.” – Fox News political editor Chris Stirewalt, speaking today on Outnumbered.